The epicenter of the quake, which struck just before midnight local time, was just southeast of the Tehuantepec gap, a 125-kilometer-long stretch of Mexico’s Pacific coast that has been seismically silent since record-keeping began more than a century ago. All along that coast, the ocean’s tectonic plates meet the continental North American plate and are forced underneath it. Violent earthquakes mark the release of built-up pressure between the grinding plates. But the ruptures have somehow avoided the Tehuantepec gap and the Guerrero gap, more than 500 kilometers to the northwest.For decades, scientists have monitored the Guerrero gap because of its proximity to Mexico City. A rupture there could devastate the capital, which is built on a drained lakebed that amplifies seismic waves. 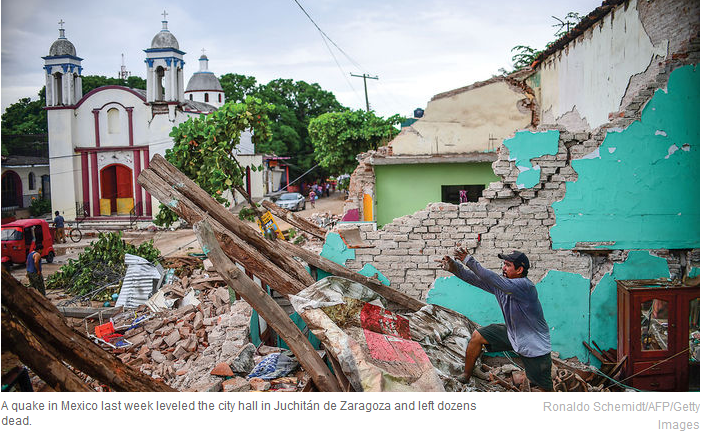 In 1985, a magnitude-8.1 quake near the Guerrero gap killed thousands, spurring the city to install a seismic alert system and tighten building codes. Those measures seemed to help last week: The capital sustained little damage in spite of considerable shaking.